Obama Warned Trump About Michael Flynn During Oval Office Meeting Ex-Obama officials say their former boss raised red flags about the man who became Trump's national security adviser in a November Oval Office meeting. Trump ignored them; Flynn resigned in February. 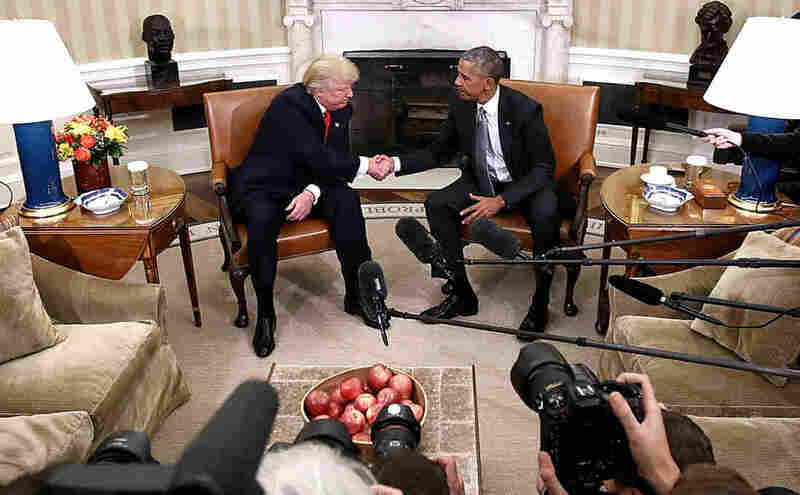 President Barack Obama and then-President-elect Donald Trump shake hands following a meeting in the Oval Office on Nov. 10. A former Obama official says Obama warned Trump about Michael Flynn, whom Trump later named as his national security adviser. A former Obama official confirms that then-President Barack Obama warned incoming President Donald Trump about Michael Flynn related to his job performance as head of the Defense Intelligence Agency. Obama and Trump met in the Oval Office shortly after the election in November. Flynn was fired as head of the DIA during Obama's administration. It has been widely reported that it was over management issues. Trump named Flynn his national security adviser, but Flynn was forced to resign in February after reports that he spoke with a Russian official about U.S. sanctions and then misled Vice President-elect Mike Pence about the conversations. News of Obama's warning comes ahead of former Obama Justice official Sally Yates' testimony before a Senate subcommittee at 2:30 p.m. ET on Monday. Yates is a key voice when it comes to questions about what — and when — the White House knew about Flynn's conversations with Russian officials. Trump has already been on defense, tweeting Monday morning that Flynn was granted security clearances during the Obama administration, when Flynn headed the DIA. In Monday's briefing, White House press secretary Sean Spicer said, "It's true that ... President Obama made it known that he wasn't exactly a fan of Gen. Flynn's." He said that should not be surprising, "given that Gen. Flynn had worked for President Obama, was an outspoken critic of President Obama's shortcomings, specifically as it related to his lack of strategy confronting ISIS and other threats around that were facing America." Spicer further questioned why, if the Obama administration had concerns about Flynn, it did not revoke Flynn's security clearance. NPR's Scott Detrow contributed to this report.